If you’ve ever wondered where the leadership of the millennial generation will come from, look no further than Kyle Denman of Colerain, the 2013 YMCA of Greater Cincinnati Youth in City Government program’s mayor of Cincinnati. The St. Xavier High School graduate recently made Ohio history at the YMCA Conference on National Affairs in Black Mountain, N.C., as only the second Ohioan to present a proposal in front of the 700-plus delegates and the third Ohio resident to be selected as a presiding officer. Denman’s presentation was titled “Daniel’s Proposal,” and involved an amendment to the Individuals with Disabilities Education Act, designed to make school easier for students with disabilities. His decision to work on this proposal resulted from a close friendship he has with a young man named Daniel from Anderson Township. Daniel has Down syndrome. Kyle spent the past year researching the Disabilities Education Act, and spoke with organizations and members of special needs programs to discuss how things could be improved at school for those with special needs. The YMCA supports the development and well-being of people with disabilities through a range of programs and services that address both specific needs as well as opportunities to integrate people with disabilities into our general activities and programs. Every year at the conference, hundreds of delegates from Youth in Government programs across the country gather for an educational experience. Each delegate prepares a suggestion for a possible law to be debated at the conference and only the top ten proposals are selected to be presented in front of the entire delegation. Denman will attend Miami University this fall. 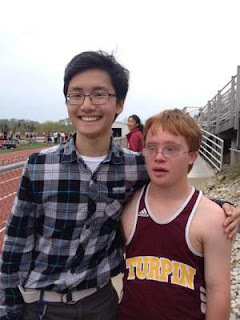 Daniel attends Turpin High School in Anderson Township. Students always love to have interesting projects for their study plan and experience for good employment and having abilities. That is the study path of students not extra load given to them they jus have experience from different http://www.annotatedbibliographyhelper.com/about-us/ website for their linking work. That daily biases work and projects help them to stay positive and creative. I not have the accept on the contrast between people yet numerous nations are have the trust in this point. I like your this parade since you do this for good reason and this close by german or english. Please try this take the necessary steps for goodness and it's exceptionally vital so those needs to go in this Procession they should go here all detail gives. Substitute proposes are in all actuality accommodating for merchants and who import and fare matters from unmistakable zones. I by and large decide on such articles wherein we can visit website get terrifi measurements fit as a fiddle for every individual to secure. In article in actuality reveals to us superb substitute proposes that are set up inside the selective territories to world. in all of reality helpful designed for dealers and even just who transfer and even do factors as a result of beautiful areas and specific zones. As i as a whole pick this type of articles and reviews where you can find out more get terrific weightings meet to provide a muck around for man or woman to help you obtain. On guide in fact brings out to help you usa wonderful alternate suggests that can be put together while in the discerning areas to help you universe. When i mostly make a decision on like articles click here blog posts whereby we can easily stop by web page receive terrify size healthy to be a fiddle for any specific to help safeguarded. With document literally uncovers to help you excellent exchange suggests which might be established into the not bothered territories to help earth.